Take advantage of AAV-based gene delivery for gene therapy development and other applications with this dual promoter vector, pAAVK-EF1α-MCS1-CMV-MCS2. Widely used for gene therapy development and gene editing in vivo because of their broad tropism, lack of associated disease, the ability to transduce both dividing and non-dividing cells, and long-term transgene expression, recombinant AAV vectors are becoming increasingly popular. To help researchers take advantage of the powerful AAV system, SBI has developed a series of AAV vectors optimized for easy cloning and high titers. 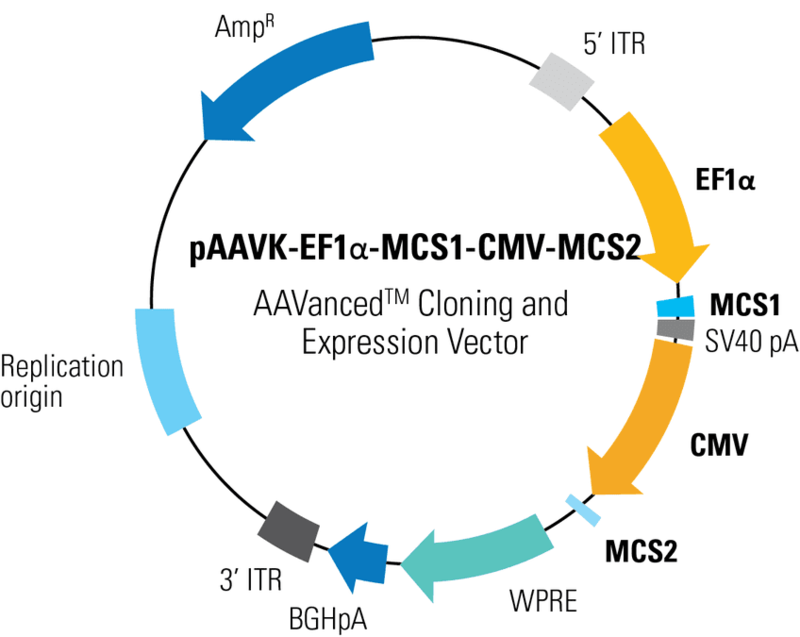 The pAAVK-EF1α-MCS1-CMV-MCS2 AAVanced™ Cloning and Expression Vector is an AAV vector that enables the expression of a gene-of-interest by the EF1α promoter and any marker or a second gene from the CMV promoter. Because packaging into the AAV capsid limits the size of AAV vectors, the total amount of DNA between the two ITRs in SBI’s AAVanced Vectors needs to be 5 kb or less. Figure 1. SBI’s dual promoter AAVanced Cloning and Expression vectors are delivered effectively to target cells and express the desired markers. Representative images for GFP/RFP/Puro marker expression in HT1080 cells transduced with pAAVK-EF1α-MCS-CMV-EGFP (top row), pAAVK-EF1α-MCS-CMV-mRFP (middle row), or pAAVK-EF1α-MCS-CMV-Puro (bottom row). The top two rows compare cells transduced with the indicated vector packaged into AAV particles versus cells transfected with the same vector. Both conditions show good expression of GFP or RFP. The bottom row shows the number of cells present after three days of puromycin selection in the well with or without infection with pAAVK-EF1-MCS-CMV-Puro packaged into AAV particles.